Nicole Curtis (left) shows off Bernzomatic torches. TV host and DIY personality Nicole Curtis held an exclusive meet-and-greet at the 2017 Spring show. 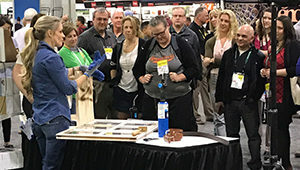 The self-taught rehabber, designer and author engaged Ace retailers on Friday, March 17, during a demo of the new Bernzomatic torch kit. Bernzomatic is the industry leader in handheld torches, and Curtis is the campaign ambassador to the blazing brand’s Find Your Fire Community Grants. This is a program that helps DIY enthusiasts in local areas create startup projects of their own. As part of the showcase, Curtis interacted with attendees and encouraged them to use their talents and skills to give back to the community.